Sun Dermatology is proud to use the enlighten™ laser system for patients in Bay County and Panama City that are looking for tattoo removal. 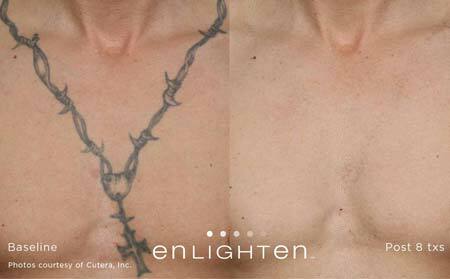 enlighten™ is one of the most advanced laser systems for the safe and effective removal of tattoos and pigmented lesions. This laser has also shown to be effective for removing difficult to treat red and blue ink. Enlighten is different from other lasers in that it uses a short, high-powered laser pulse (known as a picosecond) that quickly breaks down ink particles in the skin. Removing the full range of tattoos and pigmentary concerns requires the ideal combination of technologies—the right wavelengths, the right pulse durations and the right energy levels. enlighten™ brings those features together in one complete system. Picosecond lasers have been shown to remove tattoos efficiently and completely, with fewer treatments than required for a traditional laser. Picosecond lasers are much faster than traditional tattoo removal lasers. One treatment with this laser typically takes about 2 to 5 minutes once started. The laser tattoo removal procedure with the enlighten™ system is generally well tolerated. Sun Dermatology uses numbing agents to lessen the discomfort and there is no downtime associated with this treatment. After the treatment session, patients can immediately return to their daily lives, although the treatment area should be protected from sun exposure. Side effects are typically mild and could include redness, tenderness and swelling of the treatment area. The total number of treatments to remove a tattoo varies by patient. More treatments may be required especially for colorful tattoos, as well as those that are larger. For more information on enlighten™ and Laser Tattoo Removal in Panama City or to schedule an appointment, contact our office today.